Click for State Insurance Agent License Lookup Links. Below are the current state resident and non-resident appointment fees. State appointment fees for insurance companies are calculated by the department of insurance for each respective state and are therefore subject to change. Regarding special issues on state appointment fees for insurers, speak to a licensing specialist at (800)770-0492. There is no obligation on your behalf to speak to us. 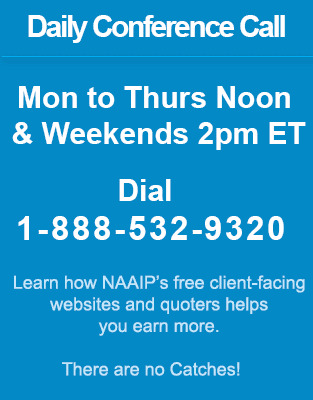 As well, join our daily conference call at Noon Eastern Time. No Fees in AK, AR, AZ, CO, HI, ID, IL, IN, MD, MO, MT, NY, OR, RI, SC & UT. Appointment fees are for the states of: AK, AL, AZ, AR, CA, CO, CT, DE, FL, GA, HI, ID, IL, IN, IA, KS, KY, LA, ME, MD, MA, MI, MN, MS, MO, MT, NE, NV, NH, NJ, NM, NY, NC, ND, OH, OK, OR, PA, RI, SC, SD, TN, TX, UT, VT, VA, WA, WV, WI and WY. License fees for the various states for non-resident agents - any state with retaliatory fees will vary depending on where you are a resident. These are the fees that a non-resident will pay to attain the original non-resident insurance license. Vermont *Additional retaliatory fees will be applied depending on state. New York *Additional retaliatory fees will be applied depending on state. Tennessee *Additional retaliatory fees will be applied depending on state. Hawaii *Additional retaliatory fees will be applied depending on state.